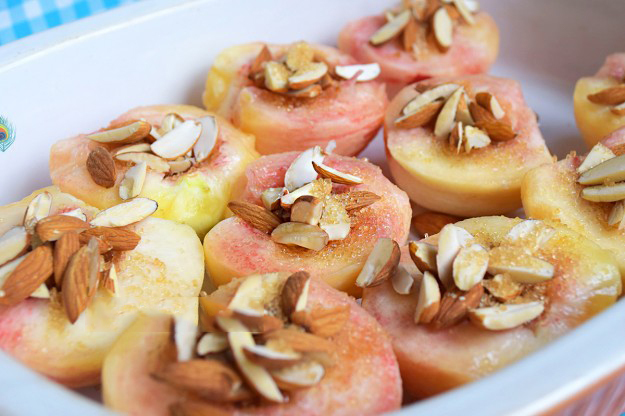 Roasted peaches with almonds, delicious dessert for the summer months. 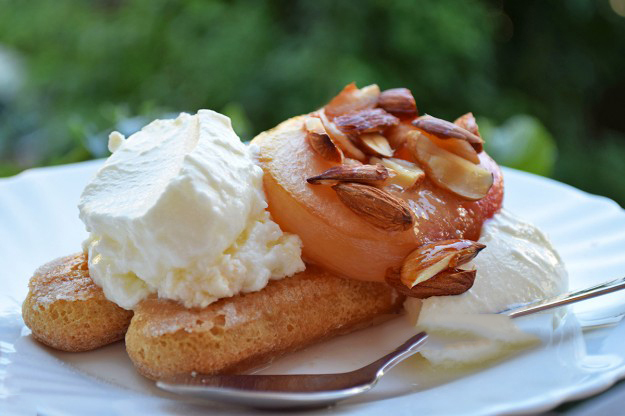 Peach desserts are most often with a swamp in which the peaches are the stuffing. 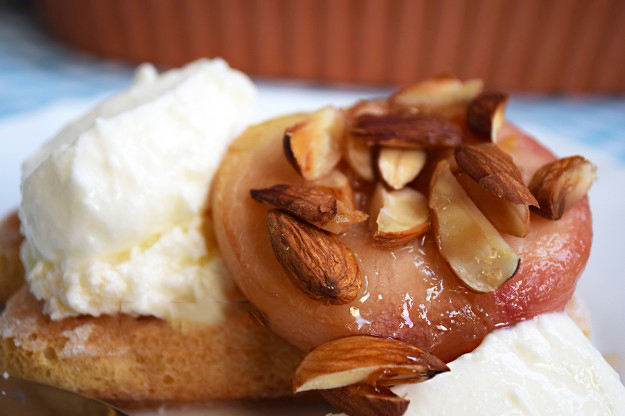 Here the peach is in focus, and the great amount of free time you will have while preparing this recipe. I make the clarification, as always, that the best way to eat fruit is to be raw, dried or at least freshly made of juice. But if you have 2-3 fruit trees like us … you sometimes find that you can try something different. If you want to be quick – roasted peaches are your recipe. You make the child a fresh juice of peaches, and while you drink it, you have already washed your hands and the peaches are baking. The raw almonds are cut. The peaches are divided into two pieces, the stone is removed and peeled. They are placed in a tray with the bottom down, sprinkled with sugar – it’s a little taste, I prefer to put one teaspoon of brown sugar on each half and sprinkle with sliced ​​raw almonds. dd one tablespoon of water for each number of peaches. I baked 5 peaches – I put 5 tsp of water. Bake to gold or caramel in an oven heated to about 190-200 degrees. Two or three times it is good to dip the almonds so that they do not burn. Peaches are allowed to cool and then cool well in the refrigerator. Wonderfully go with an ice cream ball. But I have a thick, home-made yoghurt, thicker than crushed milk, so it would be a shame not to prefer it, so I ordered 2 biscuits in the dish, I poured some sauce left by baking, added sour yogurt and roasted peach. If you also have plenty of peaches and time, try Sweet Peach or Sweet peach and wild blackberries. If you are wondering why the peach meat looks so white, I will tell you that this is a unique variety I have only seen in our garden. The peach is white and very, but very juicy. When she squeezes her gently she drops effortlessly into juice. But it has its own minus, as you cut it off the tree, its delicate flesh, where you touch it with your fingers, starts to soften immediately, and if you leave it too much and rot. That’s why you will never meet this variety in the store. They are too gentle. And with many other good things in life it is. You will not meet them in the usual place, you may have to raise them.